I hear those sleigh bells ring-a-ling-ding-ding-ding-a-ling-doo. I’m not even joking! I swear everywhere I go these days I can hear Christmas music and sleigh bells! I should probably get it checked out… I think I’ve got a case of Tinselitus! Ok…that joke may have come out of Christmas cracker but all the best jokes do, right? Christmas has well and truly arrived in my house. Having put up the tree last week, I was super excited when the Christmas Fayre at work came around and I got to bake my first batch of mince pies. I used to bake these with my Mum on Christmas eve but since moving to London and starting full time work it’s another tradition that has fallen by the wayside. Instead I now get to bake them whenever I like! Hurrah! The Elf is my favourite! Which one is yours? We have a rather accomplished Charity Bakers Club at work, and every time there is a big event for our firm’s charity, we all chip in for a Charity Bake Sale. Christmas is no different! 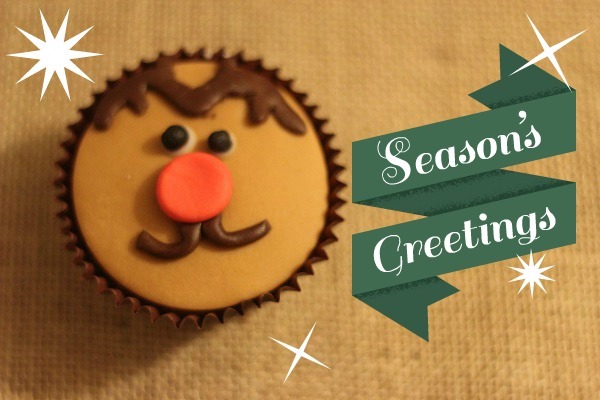 I had signed up to make my traditional and marzipan mince pies (coming soon) as well as some Festive Character Cupcakes. If I had only known how popular they were going to be, I would’ve made more. Some of them didn’t even make it to the Fayre as some of the other bakers purchased them straight off of me (all money still going to the charity of course). After baking a batch of 12 vanilla cupcakes at the weekend, I decorated them as Snowmen, Rudolph, Father Christmas and a happy little Elf! If you too want to make these sweet character cupcakes, just follow the instructions below. Blank faces ready to be decorated! 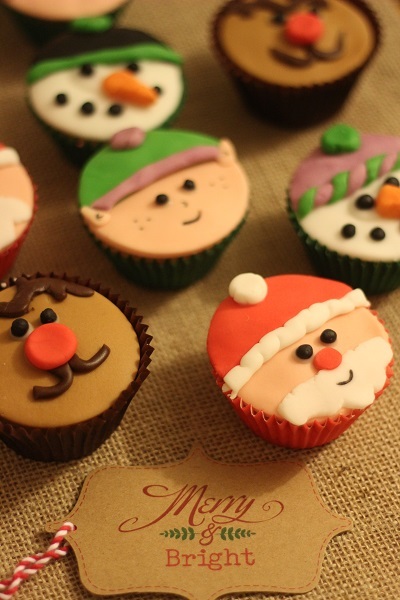 Find out how to make Rudolf, Father Christmas, Elliot the Elf and Jack Frost cupcakes with these simple instructions. Begin by rolling out the white, peach, and light brown sugar paste roughly half a centimetre thick. Cut out 4 white circles, 8 peach circles and 4 brown circles using the cookie cutter. These will form the base of the faces. Coat the tops of the cakes with a thin layer of glace icing and stick the sugar paste circles to the cakes. Take a ball roughly the size of a 50p piece of dark brown sugar paste and roll out until half a centimetre thick. Using a sharp knife cut out the shape of antlers freehand. Coat the back with a little glace icing and still to the top of the cake. With the remaining dark brown sugar paste, roll a thin sausage and create a ‘W’ shape. Stick this to the cake top so that the centre of the ‘W’ is in the centre of the cake. Just a few millimetres below, carefully dab two eyes using a spoon and the glace icing. Take a little bit of black icing and roll two small balls to create the pupils for the eyes. Place these carefully in the centre of the two white dots. Repeat for each brown cupcake. Roll 6 small balls out of the black icing. Dab two eyes of glace icing in the centre of the cap and add two balls for pupils. Using a small amount of glace icing, stick the remaining four balls in a crescent shape to form the snowman’s mouth. Next take a pinch of orange sugar paste and form into a triangle, much like a carrot nose. Stick this with glace icing just below the eyes and in the centre of the cupcake top. For the snowman’s hat, roll the purple icing roughly half a centimetre thick. Cut out a whole circle using the cookie cutter. With the sharp knife, cut this in half. Place one half to one side to use as an elf’s hat later. Stick the hat to the cake using a little glace icing. Take a small amount of purple sugar paste and roll into a sausage roughly half a centimetre longer than the diameter of the cake. Do the same with the green sugar paste. Place the two “sausages” next to each other and twist. Pinch the ends to seal and stick along the bottom edge of the hat to create a stripe-y trim. Take a pinch of green icing and roll into a ball, flatten and then using the knife, score grooves around the outside to look like a pom-pom. Stick to the top of the hate with a little glace icing. Repeat for each white cupcake. Roll the red sugar paste roughly half a centimetre thick. Cut out a circle using the cookie cutter. Cut this in half and place one half to one side for use on another Father Christmas cupcake. 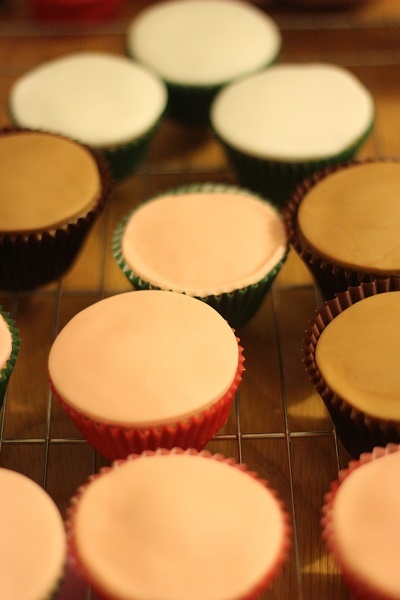 Stick the red half to the top of the cupcake with a little glace icing. Roll a ball and a sausage with the white sugar paste and using your knife create grooves along the edges to create a pom-pom effect. Attach the round pom-pom to the top of the red half of the cupcake and attach the sausage along the bottom to trim Father Christmas’s hat. For the eyes, roll two small balls from the black sugar paste. Attach with a little dab of glace icing. Using the sharp knife, cut a beard free hand from the white sugar paste. Use semicircle movements in roughly a triangular shape” Stick to the cake with glace icing. Finish off the Santa Clause cupcake with a flattened ball of red sugar paste for a nose, and a small smile with the edible marker. Repeat for 3 peach cupcakes. For the elf’s hat, roll the green sugar paste roughly half a centimetre thick. Cut out a whole circle using the cookie cutter. With the sharp knife, cut this in half. Place one half to one side to use as a snowman’s. Stick the hat to the cake using a little glace icing. Take a pinch of purple sugar paste and roll into a ball, flatten and then using the knife, score grooves around the outside to look like a pom-pom. Stick to the top of the hate with a little glace icing. Just a few millimetres below, carefully dab two eyes using a spoon and the glace icing. Take a little bit of black icing and roll two small balls to create the pupils for the eyes. Place these carefully in the centre of the two white dots. To finish, take some remaining peach icing and roll into two small balls. Pinch half of the small ball to create a pixie ear shape. Attach both ears to the edge of the cupcake, slightly overlapping the trim of the hat. Repeat for the remaining peach cupcakes. My personal favourite has to be the Elf. I was pretty happy with how life-like it looked! I always knew they’d be a little cartoony but I still wanted them to look professional. I’m quite pleased with how they turned out. The only downside is how long they took me. These are fantastic to make if you have a spare afternoon, but doing these at 9pm at night isn’t ideal! So do make sure you leave plenty of time to make them. I also wish I had had more colours to play with when making the elf and Snowmen’s little hats! Perhaps you could give them matching scarves too?! The possibilities are endless! All you need is an imagination. Do you have a bake sale at work for Christmas? I think cake is a great way to bring people together – even more so if the cakes are festive! 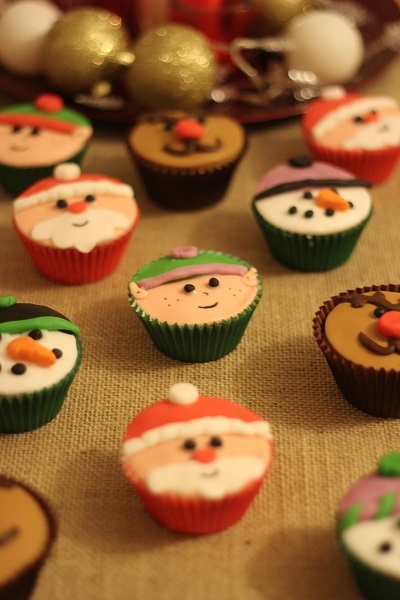 Have you been baking Christmas cupcakes too? Please feel free to share them in the comments! I love these cupcakes!!! Yes the elf is so cute!!! They all put me in the Christmas spirit! !